As a standard rule, online bookmakers often provide exclusive Android mobile apps. EvoBet, however, has yet to establish a devoted mobile app for Android users and has opted instead to provide access to their mobile services through a mobile browser version of their site without any need of having to download software. The mobile version features the same first-rate quality in betting that is derived from the desktop site, and equally, punters have access to the same promotions, bonuses, deposit and withdrawal options and support options. To visit the EvoBet mobile site, just open your preferred mobile browser, enter the Evobet mobile site address and log in with your existing details. Alternatively, if new to Evobet, click on the “Join” button and register a new player account. As previously mentioned, EvoBet has chosen to abandon the use of an iOS Mobile App, choosing instead to establish their mobile presence via an iOS compatible mobile browser version. This approach delivers convenience to iOS followers with direct access to EvoBet and thereby giving punters direct access to all its betting markets, promotions and features. This eliminates any concerned of viewing and size qualities as Evobet’s mobile site is formatted for all iOS devices, thus guarantying full functionality in respect to the layout and design. As with Android users, all that is needed to access the Evobet mobile site is opening of a mobile browser and navigating to the Evobet mobile site. Then just log in if an existing member, if new, create a new account to gain access to its betting markets and features. EvoBet, in achieving its goal to meet the demands of sports-minded mobile players, has created a mobile site that features all its betting markets, including that of a live casino, online casino, sportsbook and in-play betting. Those efforts not only meet the needs of mobile players but surpasses them and as a result, delivers an experience that allows for easy navigation and a feeling of familiarity. Existing members to EvoBet will find the colour scheme used with the desktop site built into the mobile site. Conveniently placed drop down menus will provide quick access to the casino and live dealer betting markets, and complementing this, conveniently located navigational buttons will direct punters to promotions, results and statistics, support and more. That same thoughtfulness implemented in its overall design is carried through to its casino and live dealer section through the use of slider bars that highlight current promotions and for those looking for specific live dealer games, a listing of its available live dealer game suppliers. Collectively, the combination of those mentioned above takes the punter experience to an elevated level and removes any need for a dedicated app, regardless of it being Android or iOS. EvoBet’s mobile website is a part of a well thought out design, purposely built to fit the needs of mobile devices and optimised for touch-screen controls. Punters can relish in being able to quickly access, at will, a great sportsbook, in-play betting and a casino that features classic slots, table games, video poker and live dealer games. Its options for comprehensive betting creates an atmosphere that makes time spent functionally pleasant leaving little left untouched. The mandate of focusing on positive mobile site is evident from the minute you access its features, and as such, we have included those most popular that support that. Evobet, not one to miss out on offering its mobile punters the same luxuries it does its desktop punters, offers a cash-out feature on select games and matches, that will allow for the early settling of bets prior to the conclusion of a game or event. This feature is ideally suited for bankroll management and the reduction of losses when of the mindset a wager will not end favourably. The options for in-play betting at EvoBet are rather extensive and permits exciting in-live betting on a wide assortment of sporting events such as Ice Hockey, Soccer, American Football, Rugby and more. This feature is ideally suited for punters who wish to wager on live games with real updated odds. It is a proven tactical feature experienced punters utilise in their pursuit of sports betting success as within the In-Play feature is an extensive volume of related statistical information needed for the selection process of deciding the most favourable outcome. The Live Streaming option at Evobet is one of its stronger features. This is due to its providing the ability to watch in real time your favourite sporting events and place real money wagers while doing so using your mobile device. As with In-Play betting, it also includes updated odds in real time and furthermore consists of an equally valuable range of statistical information relating to teams participating, past results and information on individual players. Mobile punters are greeted with a large variety of betting options at EvoBet’s mobile version. That in itself shouldn’t be met with surprise as today’s mobile-friendly sportsbooks feature the same high-quality betting options as its online desktop counterpart, and in that respect, Evobet has excelled in meeting the growing needs of a preferred mobile population that prefers access its online entertainment via a mobile device. As such, we’ve highlighted four of those betting options available that are known to have the most significant impact on punter betting experiences. Sports betting is a significant focus for EvoBet and resultant on that, punters will enjoy the luxury of 48 different sports at their disposal. The range of sports has been structured to include most significant sports of interest such as Soccer, Baseball, Cricket and Rugby, but extends beyond that of the norm to add unique, less frequently offered sports such as Water Polo, Squash and Netball even going as far as to introduce betting opportunities for Politics, TV Shows and Movies and Chess. Of course, within each is a unique number of betting options that are in place to allow flexibility with the bets placed and with it, increase the quality of betting experience, whether betting traditionally or via its In-Play and Live betting sections. EvoBet, as mentioned above, also has chosen to complement their sportsbook and In-Play betting options with a fully-functioning mobile casino. While many sportsbooks that feature an online casino dismiss the value they provide punters, Evobet has chosen to partner with leading software developers in a bid to offer not only a quality-driven online casino but one on par with the best of those found online. That selection of partners has seen the implantation of gaming content from ELK Studios, Betsoft Gaming, NextGen Gaming, Play’n GO, Pragmatic Play, NetEnt and Betsoft Gaming to name a few. The extensiveness of its gaming library includes multiple gaming categories such as slots, classic slots, video poker and table games, but also additional functionality options with categories for Top Slots, New games and virtual betting, all designed with a single purpose towards making your time spent at Evobet the best it can be. EvoBet’s live casino is just as equally exciting as the mobile casino, in part due to its selection of live games, in part due to the quality that is derived by Evolution Gaming. When compared to its casino game selections, the number of live dealer games might be less but reflect those most are drawn towards including Blackjack, Caribbean Stud Poker, Roulette and Texas Hold’Em. 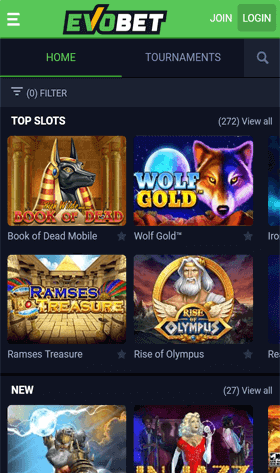 To ensure a complete and viable selection of games is in place, Evobet opted to include several unique or less known live games such as Dragon Tiger, Dream Catcher and Football Studio. Its value is multiplied by professionally trained, attractive dealers that have refined execution with their dealing responsibilities while communicating in a professional, yet friendly manner to ensure the overall experience meets expectations towards a high valued live casino experience. The virtual sports betting section at EvoBet has achieved a status amongst punters and competitors alike. In additions to separating itself from live other games, virtual sports has been able to adjust itself with the current trends in the market. Powered by Inlet and BetConstruct, virtual punters will have access to a constant stream of virtual horse racing, football pro, virtual tennis, car racing, greyhounds and virtual bicycle sports. The addition of its virtual betting is a welcome sight that while not all find appealing, the younger audience, more adept to virtual style gaming, will find it one they are keen to embrace. A variety of betting options are providing, each relevant to their respective sport and include such options as Over/Under, Asian Handicaps, First team to score and multiple others. The reality, or should we say, differences, between the mobile and desktop platforms and few, and for punters, especially those preferring to access via their mobile devices, this is seen as a positive. The only real difference, at least notably, is the viewing capabilities in so far as the screen size. All others are substantially equal as the two platforms are identical in the betting markets and betting options presented to punters. The same number of sports, live streaming, in-play and its online casino with live dealer games, and of course, the virtual sports section, all are offered to mobile punters, and concerning its quality, there are zero differences. The only area that might be seen as a disadvantage for the mobile user is possible connectivity issues relating from Wi-Fi speeds when connecting to some networks. Overall, the advantages far outweigh the cons. Compatibility for mobile devices can be, at times, a concern for punters not in possession of the newest models and who wish full, unbridled sports betting access. The comfort in this is the technology in place behind the Evobet mobile version allows unrestricted access that is correctly formatted to fit any of the handheld devices on today’s market, irrespective of the model. The main concern as to whether the access device’s compatibility pertains to its operating system, not that of who manufactured it. As such, if using a newer model, accessibility will not be an issue, and likewise, those with older models will have the same access but may experience some graphical quality. To ensure your mobile device compatibility, only verify you have the latest operating system installed. Below, a list of those known to be compatible with the Evobet mobile site. While EvoBet offers Android and iOS Mobile betting through the mobile browsers of each respective device, it doesn’t feature mobile specific-bonuses or promotions. This is quite standard in today’s sportsbook landscape with most, like Evobet, preferring to offer all promotions and bonuses equally across all its platforms. As such, registering members using the mobile site will be pleased to learn they qualify for all promotions, including the welcome bonus and subsequent returning player promotions. In EvoBet’s continued effort to complement its sports book, live casino, virtual casino and mobile casino, they’ve compiled a popular selection of payment methods that can be used on both its mobile and desktop casinos, all of which are safe and secure using the latest in SSL Encryption technology. While the choice of methods is more geared towards those most popular, for some, there might be fewer than they’d hope for. Regardless of this, there are plenty of online e-wallet and credit card methods that are globally accepted. For a measure of convenience, these have been listed below and include the minimum, and maximum amounts accepted as well as withdrawal processing times. I wish to register an account on the Evobet mobile version. Is that allowed, or must I register through the desktop site? Yes. Evobet offers the ability to register a new account on both its desktop and mobile sites. You only need to visit the Evobet website of choice and click on the green “register” button. This will redirect you to the registration page that will request you complete a variety of personal details such as your name, residential address, telephone number and email. Does Evobet offer live streaming via its mobile version? Yes. As with its desktop site, the mobile version offers same betting features. To view its live streamed sports events, navigate to the “Live” section, then follow to the “Live calendar”. Under this section, you will find all live streamed sports being offered. Does Evobet offer In-Play betting via the mobile version? Yes, as with its live streaming, Evobet includes in-play betting under its mobile version. All in-play sorts will be found under the “Live” tab. Just select the match or game you are interested in, and you can then place your bet. Does Evobet have a loyalty program or offer VIP benefits to loyal players? Unfortunately not. Evobet does, however, provide an extensive range of promotions geared towards its sportsbook and online casino. This includes several welcome bonuses as well as special promotions geared towards existing members. You can view its current promotional offerings by visiting the Evobet promotions page. Am I able to contact Evobet support using the mobile version or is support only reachable via the desktop site? Yes. Evobet has conveniently located a direct link to its live chat support at the bottom of the mobile site. The live chat support feature is available daily from 0:900 to 01:00 CET. Alternatively, during off hours, support may be contacted via email at support@evobet.com. Am I able to log into my account using a VPN? Yes, as long as you are accessing via a country that is supported by Evobet based on their licensing agreement with the Government of Curacao. However, while this is possible, Evobet does not condone nor allow those who are using a VPN in hopes of bypassing local jurisdictional laws. If I register an account at the desktop site, will I still be able to use the same account via the mobile website? Yes. At Evobet, one account allows access to both platforms. Simply enter your login details and proceed to place bets as you usually would via its desktop site. It is advised however that you maintain a record of your login information and avoid sharing those details with any third party. Evobet, a company incorporated in Curacao, is a relevantly new sportsbook offering a variety of betting services. First established in 2018, it is licensed (License No. 1668/JAZ) and regulated by the Government of Gibraltar and owned by CW Marketing BV. It carries out its operations at C58264, Suite 1 Sterling Building, Enrico Mizzi street, Ta’xbiex, XBX1453, Malta under the name EvoplayLimited. As a result of its license, it is authorised to offer gambling services to a variety of jurisdictions except for some countries including North America and Greece. EvoBet has, since its inception, focused on growing its betting markets to appeal to a broad spectrum of punters, both with a focus towards sports and in providing a fully functional and easy to navigate online casino. While it may not offer dedicated mobile apps, its mobile version is more than sufficient to meet the needs of those looking to place on the go bets, and as such, provides, in many cases, a superior betting platform over that of a bookmaker with dedicated apps, which generally require continual app updates. The design elements in place have created an appealing and easy to navigate mobile site that is well presented and near identical to its desktop counterpart. While its support options could be improved upon, as could its offered banking methods, the overall rating for Evobet, based on the above, is 7 out of 10.